A meditation garden is your personal spiritual retreat in your own yard. For most people the primary purpose of a meditation garden is to provide a quiet place where you can renew your body, mind and soul. A meditation garden should be a temporary reprieve from stress and a place where you release tension. To achieve this, you need to let all family members know that the meditation garden is a quiet place where arguing, fussing and fighting are not allowed. You can enjoy your garden alone or invite your kids to bring a book, drawing materials or any other items they enjoy during quiet time. There are many elements that can be included in a meditation garden to make it your perfect retreat. Water: Water is peaceful and has a calming effect. It is also useful in blocking out noise. A note of caution is that standing water attracts mosquitoes, especially in the summer, so any water that is used should be flowing, as in a fountain. Simplicity: Keep your meditation garden simple and clutter free. Study after study has shown that for most of us, clutter causes stress. Separation: It is important to create a sense of separation from the rest of the yard. This means clearly marking off a space through the use of hardscaping, paths, etc. Maintenance: Keep it low maintenance. The last thing any of us needs is one more thing to maintain. What type of prep work was needed before you created your garden? Joan: First we marked off the area to be used for the garden. Then we brought in about ½ of a dump truck filled with dirt to cover an area that is approximately 25 x 20. What plants did you use in your garden? Joan: We hired a landscape coordinator (Leslie Robson of Dragonfly Landscaping) to help us design and create our garden. We used Leslie about five years ago to put in a Tennessee fieldstone front walk. I explained to her that I wanted a meditation walk on a patch of ground in the backyard where nothing would grow. After bringing in the soil, I laid out the path of the walk with chalk and she dug out the path and lined it with red crushed rock. 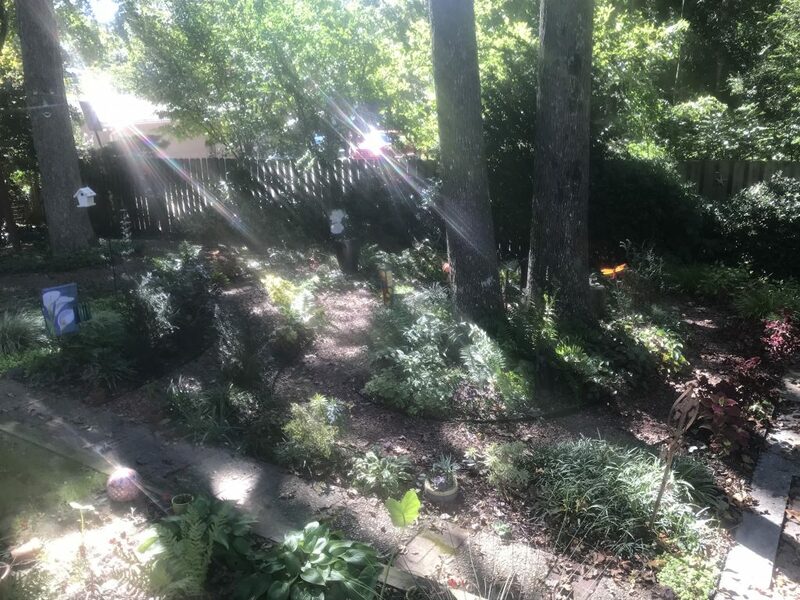 To keep the space low maintenance Leslie planted mostly perennials, including ferns, grasses, hostas, creeping jenny and heuchera to fill in the open spaces. Since the area is almost totally shade, it is perfect for shade loving plants. Since initially creating the garden I have added coleus and other annuals to add color, as well as some pollinators. Do you have any other elements beside plants in your garden? Joan: I have some yard art, an antique bee bath, Celtic crosses, statuary and two floral flags. At the end of the walk I have a chair at the base of a tree, with a tree stump table to hold my meditation stones and any readings I carry to the garden. What do you like best about your meditation garden? Joan: It is a lovely, quiet place in nature that resonates with tranquility and peace. Joan: Nothing. If you are hiring someone to help you it is important for them to understand what you are trying to do. Leslie understood my design and interest in converting unused ground into a beautiful tiny nature preserve for silence and meditation. Is your garden totally natural? Joan: It is totally natural. No pesticides are used. Do you have any advice for someone putting in a garden? 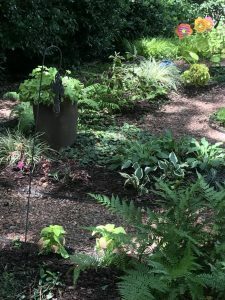 Joan: I relied on Leslie to help with the things where I had limited knowledge, like creating the walk and selecting plants appropriate to a shady environment. Otherwise, I would suggest that people select the space and plants that reflect their personal tastes and landscaping requirements. Why did you plant a meditation garden? 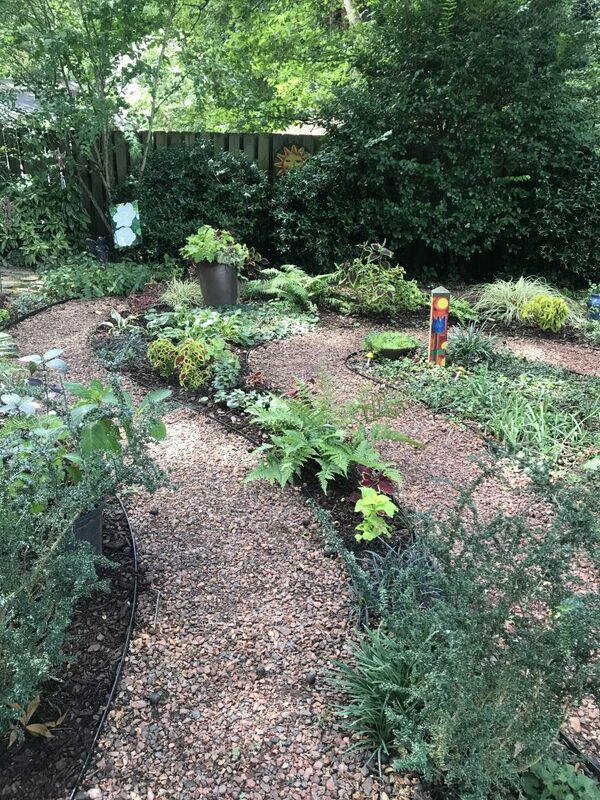 Joan: I am the coordinator of the labyrinth at my church, Redeemer Lutheran in Midtown, and have always cherished the idea of being able to have my own personal labyrinth. However, the space in our backyard was too small for a labyrinth so I realized a meditation walk would work perfectly. When do you use your garden? 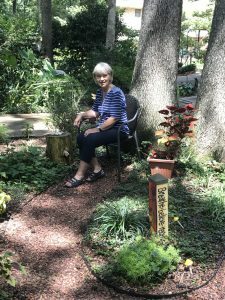 Joan: I use it in a variety of ways: mostly with my daily meditations, occasionally I take a book there or I just quietly sit and enjoy the sounds of nature. In addition, it is a lovely garden to view as we sit on our deck.